It's finally here! AMD rolled out its latest high-end GPU, codenamed "Cayman", which tops the Northern Islands, AMD's second-generation DirectX 11 compliant GPU family. Using this, AMD is initially carving out two enthusiast-grade products: the AMD Radeon HD 6970 (reviewed here), and the Radeon HD 6950, both released today. There's also scope for a dual-HD 6970-GPU product in the near future, called HD 6990. 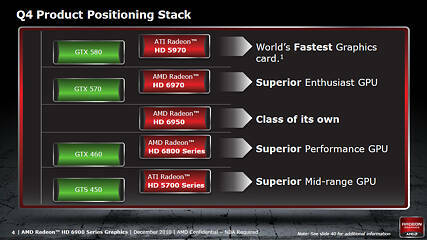 AMD's Radeon HD 6970 "Cayman" GPU faced quite a few hiccups en route today's launch. It was slated for mid-November, but was delayed by a month due to component shortage. Meanwhile, NVIDIA went ahead with a hard-launch of its GeForce GTX 580 graphics processor, and subsequently, the GeForce GTX 570, to counter the HD 6970. With Cayman and the HD 6970, AMD is introducing its biggest design change for the GPU's SIMD processing area since Radeon HD 2900 series, it's also introducing a greater amount of parallelism to the graphics engine, and doubling the standard memory amount from 1 GB in the previous generation Radeon HD 5870 and Radeon HD 5850, to 2 GB on both Radeon HD 6970 and HD 6950. As a brief lesson on AMD's naming scheme with this generation, Radeon HD 6950 and HD 6970 represent high-end single GPU SKUs, successors to HD 5800 series, while the recently introduced HD 6800 series are in a segment of their own with no definitive predecessors. The Radeon HD 6970 from HIS we're reviewing today, sticks to AMD's reference board design, including adherence to reference clock speeds. With HD 6900 series, AMD made sure that users of all HD 6900, including those which are factory-overclocked, have access to reference clock speeds at the turn of a switch (detailed later down the review). The Radeon HD 6970 features 2 GB of GDDR5 memory, carries clock speeds of 880 MHz core and 1375 MHz (5500 MHz GDDR5 effective); and display outputs including two DVI, one HDMI 1.4a, and two mini DisplayPort 1.2. This slide from AMD instantly tells you the amount of damage the surprise hard-launch of NVIDIA GeForce 580 and GTX 570 caused to the HD 6970 and HD 6950 positioning. Take those two out of the equation, and we're actually seeing the GTX 480 (which has roughly the same performance as GTX 570) being edged past by HD 6970, and HD 6950 way ahead of whatever else is down there from NVIDIA (GTX 470, GTX 460 1 GB). AMD is still banking on the previous-generation HD 5970 dual-GPU graphics card to hold the performance leadership (which it is loosely holding on to, with the potential of losing it to the GTX 580 with one good GeForce driver snatching that leadership); HD 6970 to be a notch lower in price but somewhere between GTX 570 and GTX 580 in terms of performance.